Creating a culture to support QAPI efforts begins with leadership. Support from the top is essential, and that support should foster the active participation of every caregiver. The administrator and senior leaders must create an environment that promotes QAPI and involves all caregivers. Executive leadership sets the tone and provides resources. Their challenge is to help leadership flourish in each home. Put a Personal Face on Quality Issues. Give residents, family and staff the opportunity to meet board members and executive leaders to generate support for QAPI. Tour the organization regularly, meeting with residents and caregivers where they live and work. Choose the person or persons who will be the QAPI lead in conjunction with top management—QAPI needs champions. The steering committee has overall responsibility to develop and modify the plan, review information, and set priorities for PIPs. The steering committee charters teams to work on particular problems. It reviews results and determines the next steps. The steering committee must learn and use systems thinking a nursing home has many competing interests and needs. Top leadership such as the Administrator and the Director of Nursing must be part of this structure. It is also important to have a medical director who is actively engaged in QAPI. 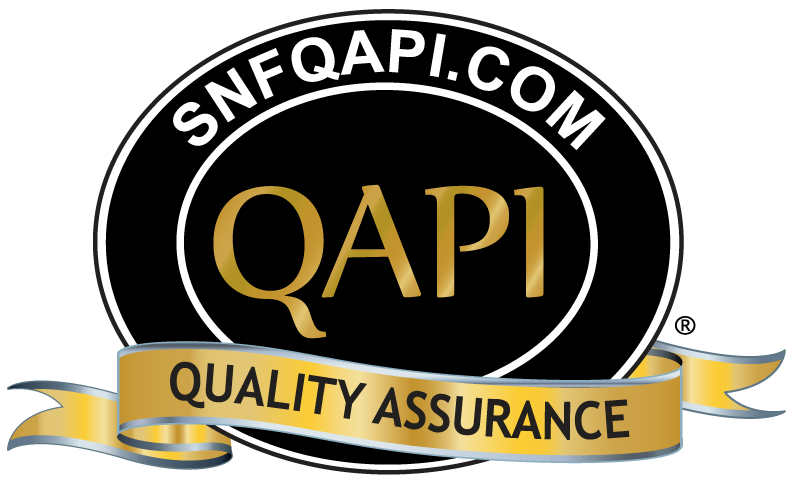 It is possible to adapt your Quality Assurance committee to become your “Steering committee” to oversee QAPI. For this to work, the QA Committee may need to meet more often, include more people, and establish permanent and time-limited workgroups that report to it. Caregivers may need time to attend team meetings during working hours, requiring others to cover their clinical duties for a period of time. Equipment might include anything from additional computers, to low-cost supplies like posters to create story boards, or multiple copies of resource books or CDs. Leadership may want to consider sending one or more team members to a specialized training. Having an open-door policy to communicate with staff and caregivers. Emphasizing communication across shifts and between department heads. Creating an environment where caregivers feel free to bring quality concerns forward without fear of punishment. Create the expectation that everyone in your nursing home is working on improving care and services. Establish an environment where caregivers, residents, and families feel free to speak up to identify areas that need improvement. Expect and build effective teamwork among departments and caregivers. 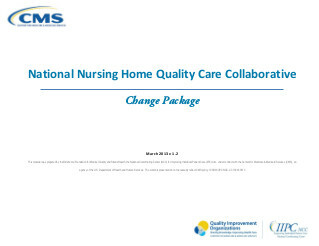 This change package is intended for nursing homes participating in the National Nursing Home Quality Care Collaborative led by the Centers for Medicare & Medicaid Services (CMS) and the Medicare Quality Improvement Organizations (QIOs), to improve care for the millions of nursing home residents across the country. The Collaborative will strive to instill quality and performance improvement practices, eliminate Healthcare- Acquired Conditions (HACs), and dramatically improve resident satisfaction by focusing on the systems that impact quality such as: staffing, operations, communication, leadership, compliance, clinical models, quality of life indicators and specific, clinical outcomes (targeted focus on inappropriate antipsychotics in persons living with dementia, falls, pressure ulcers, physical restraints, urinary tract infections, and healthcare- acquired infections). This change package is focused on the successful practices of high performing nursing homes. It was developed from a series of ten site visits to nursing homes across the country, and the themes that emerged regarding how they approached quality and carried out their work. The practices in the change package reflect how the nursing homes leaders and direct care staff at these sites shared and described their efforts. The change package is a menu of strategies, change concepts, and specific actionable items that any nursing home can choose from to begin testing for purposes of improving residents’ quality of life and care. The change package is intended to be complementary to such resources as literature reviews and evidence-based tools and resources. We gratefully acknowledge the contributions of the following organizations that so generously shared their time, effective practices, and their experiences which informed the content of this change package. 1. Strategy: Lead with a sense of purpose. Be the leader you would want to follow. Let the mission drive your actions. Plant now – harvest later: Nurture professional growth and foster innovation in others. Focus on systems for change. 1.a Change Concept: Be the leader you would want to follow. Institute an “open door” policy for all levels of leadership to establish presence and consistent availability for staff. Routinely spend time in all neighborhoods and during all shifts (spend less time behind office doors where your view, and perceptions are obscured). Hold and attend neighborhood/household meetings on all shifts. What they need in order to do their best work and provide excellent care. How you can help reduce frustrations that prevent them from doing their best work. Demonstrate interest in staff by addressing them by name. Commit to following through on issues brought to you—keep that commitment. Quickly address staff issues and requests, providing feedback to the person making the request, even if you cannot accommodate the request (explaining why and expressing genuine appreciation). Ask for help when needed, showing respect for the perspective and expertise of others. Provide help both when asked and when not asked. Set the example and pitch in! Make policies and procedures helpful and meaningful. If a policy or procedure is not effective, change it. Do not inadvertently support work-a-rounds. Align your actions with your organization’s shared values. For example, if one of your organization’s values is honoring resident choices, make sure you and your staff honor resident choices. Recognize and honor staff and resident opinions. Use their name; say that you value them; and acknowledge what you saw them do or know what they did. Demonstrate your sincere appreciation. Empower all staff, residents and family members to look for improvements and suggest changes. Follow up on their feedback (your responsiveness will bring more suggestions). Change your mind if someone has a better idea. Then give them credit. Remove negative language. Talk positively about others. Establish customer service expectations, for example, expected times for turn-around on issues raised by staff and residents. Then meet or beat that time. Seek out feedback on your individual performance and mentoring from peers. Credit others for contributions that positively affect your performance. Say “thank you” to staff because these simple words are highly valued. Find and thank at least one staff member each day for something they have done that you are truly grateful for. Ensure necessary equipment is readily available, well maintained and in good working order. Do this by creating a system where all staff members are responsible for notifying maintenance staff of problems. For example, if a certified nursing assistant (CNA) notices there is little hot water, this should be reported to maintenance for immediate repair. Track staff incidents and accidents. Conduct root cause analyses to understand what happened and take action to prevent future occurrences. Acknowledge and celebrate milestones such as six months or one year with no accidents. 1.b Change Concept: Let the mission drive your actions. Use an inclusive process to establish, review, and reaffirm your mission that involve staff, residents, and families. Ensure values are considered core to the facility and those who live and work there, for example, respect, resident-centered care, honoring wishes, service, family, enriching lives, building relationships, care, dignity, quality. Translate the mission into action. For example; create a, "caught in the act of practicing the mission and values" practice, as a way to show or point out what it means to put the mission into action. Share the mission and values with people as they are applying for work in your organization. Screen applicants based on mission and vision "fit." Include the mission and values in the orientation of new staff. For example, if "build relationships" is a core value, encourage new staff to get to know residents and establish a relationship. Share the mission and values with all staff. Ensure that there is alignment of mission and values with what is happening in the facility every day. Ensure all processes honor the values. Discuss values daily. Tell stories about how the values are carried out. Conduct regular surveys of staff and residents regarding whether the values and mission are evident in the day-to-day work and the operations of the organization. Make strategic decisions based upon mission. Ensure that mission and values are core factors in strategic decisions. Establish and focus on clear expectations for all staff that is centered on mission and values; in turn, staff will create high expectations (linked to culture and initiated at orientation and reinforced along the way) for themselves and each other. Expect the best. Build relationships with board or corporate members who may have unique connections to your community or organization that advance the mission and values. Encourage frequent visits to the facility by the board, and encourage them to speak directly to residents and staff to understand how your mission and values are embodied in your work. 1.c Change Concept: Plant now – harvest later: Nurture professional growth and foster innovation in others. Set the expectation for leaders and staff to look for and share ideas for ways to grow and innovate. Encourage staff to attend conferences and participate in state or national committees. Expect them to bring ideas back to the organization and develop a process for sharing. Guide and empower staff to solve problems. For example, leaders should respond to problems that are raised not by proposing a solution but instead by asking the team to investigate and determine what they believe would work best. Leaders serve as a resource and coach to the staff. Supply clinical and non-clinical consultants to staff, when needed, to provide ongoing learning, professional growth and success. Seek creative ideas from multiple sources within and outside the organization in order to foster innovation. Create a safe environment to test new changes, to try new ways to meet resident needs. Accept or seek out opportunities to contribute to learning in the long-term care profession. For example, participate in research studies or projects contributing to the advancement of the long-term care field. Participate in educating student nurses, PTs, social workers, aides, etc. Learn from them and their schools about new emerging practices. Make sure they are on the right path with promoting individualized care in long term care. If practices are not making sense or are frustrating to staff, residents or family, do not settle for “this is just the way it has to be”— challenge that, sort out what you have control over and look for ways to address improvements. Build leadership skills through training, support and coaching to help staff be effective. Help leaders and staff to feel in control of and committed to their neighborhoods or departments – to know that they can influence how their days go and the outcomes they achieve. Develop opportunities for leaders to learn from and support each other. For example, establish groups of new leaders and provide mentoring in order to help them understand the organization and provide support. Through this, the new leaders also become support for each other. 1.d Change Concept: Focus on systems for change. Use the root cause analysis (RCA) process to look at systems rather than individuals when something breaks down – this is a practice that will be useful not only to create a non-punitive environment but also support Quality Assurance and Performance Improvement (QAPI). Demonstrate that you are willing to take the time to investigate and understand why something happened before determining a response. Proactively look for opportunities to improve the system and avoid events by asking staff, “Where are we at risk? Where are you most concerned about making an error? Where could we improve our system or process in order to prevent errors?” This supports the expectation and importance of staff sharing information about potential problems and quality concerns. When a mistake/unintentional error occurs, do not punish staff. Assure so that they feel safe to report the problem immediately. Respond to errors or incidents based on distinguishing whether there was an inadvertent error made, versus at-risk behavior versus reckless behavior. Do not punish for errors or mistakes but instead look for how to improve the system and console the staff involved. Have leaders confer before deciding how to handle a quality breach by a staff member, rather than having each supervisor act alone. Explore process factors that might have caused the mistake so the appropriate response can be made. Build trust with and between your staff (do what you say you are going to do – if you make a promise, deliver on it). Openly admit your unintentional errors so people are less afraid to admit theirs. Recognize that having a non-punitive culture does not mean not holding people accountable. Make sure that staff members understand that there are reckless and intentional behaviors that will result in punitive actions. For example, taking tips from residents, abuse of any kind, etc. Directions: Leadership rounding is a process where leaders (e.g., administrator, department heads, and nurse managers) are out in the building with staff and residents, talking with them directly about care and services provided in the organization including QAPI initiatives. Rounding with staff and residents is an effective method for leaders to hear firsthand what is going well and what issues need to be addressed within the organization. It serves as an important signal of leadership’s commitment to performance improvement, and promotes a culture of QAPI in the organization. Use this to guide your rounds to monitor the progress of QAPI initiatives. Which leader(s) will conduct rounds? How frequently will rounds take place? What barriers/issues have already been identified that employees should be asked about in order to gather input on solutions? Leaders conduct rounds as planned, maintaining a positive tone, building relationships with staff by taking the time to listen and respond to employees’ and residents’ needs. Ask questions and document key points. See optional rounding form below. When employees raise issues or ask for help, assure them you will follow up. Follow up on previous issues or requests —share with staff how the issues were addressed or resolved. Prioritize issues (e.g., by level of urgency, threat, ability to resolve). 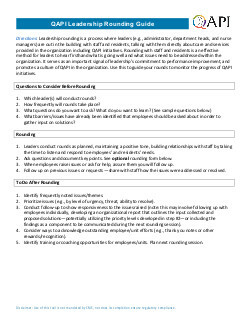 Conduct follow-up to show responsiveness to the issues raised (note: this may involve following up with employees individually, developing an organizational report that outlines the input collected and proposed solutions—potentially utilizing the priority levels developed in step #2—or including the findings as a component to be communicated during the next rounding session). Consider ways to acknowledge outstanding employee/unit efforts (e.g., thank you notes or other rewards/recognition). Identify training or coaching opportunities for employees/units. Plan next rounding session. Questions for leaders to ask staff (include any qualitative and quantitative information obtained). Disclaimer: Use of this tool is not mandated by CMS for regulatory compliance nor does its completion ensure regulatory compliance.